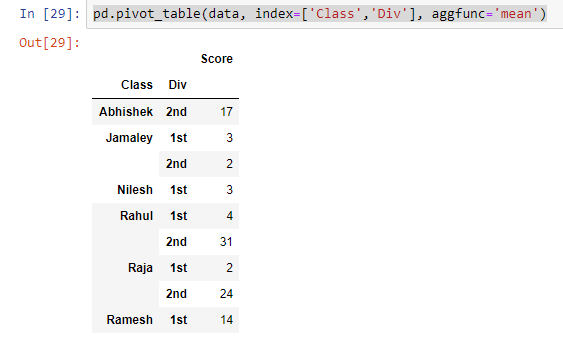 Hey Guys, today I’m going to create an article on PIVOT TABLE in Python with the help of Pandas. So, Pivot Table is basically tabled summarize data, they can be used to find unique values in a field. This is a good way to quickly see all the values that appear in a field and also find typos and other inconsistencies. We perform reading CSV File and convert into a Pivot table. Sample Data which help us to create the Pivot Table. Data is a data frame variable which holds the CSV file. Create a spreadsheet-style pivot table as a DataFrame. The levels in the pivot table will be stored in MultiIndex objects (hierarchical indexes) on the index and columns of the result DataFrame. 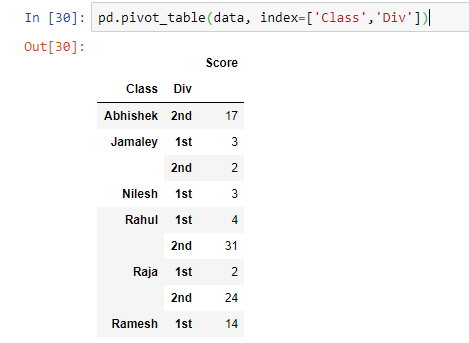 Note Table Headers for CSV are as follow – Class, Div, Score. hope this post helped you to know Creating Pivot Table with Pandas. To get the latest news and updates follow us on twitter & facebook, subscribe to our YouTube channel. And If you have any query then please let us know by using the comment form. Hello, I am Jamaley. I done My B.E StaffordShire University UK . Fortunately, I find myself quite passionate about Computers and Technology.